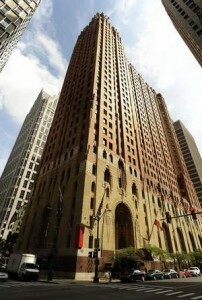 DETROIT – In the wake of revelations that City of Detroit Corporation Counsel Krystal Crittendon advised Mayor Dave Bing and the City Council against signing the “Consent Financial Stability Agreement” (CFSA), Detroiters have begun filing ethics complaints against the Bing, the Council’s “Fatal Five,” Deputy Mayor Kirk Lewis, and COO Chris Brown. The “Fatal Five” are Council President Charles Pugh, President Pro-Tem Gary Brown, and members Saunteel Jenkins, James Tate and Kenneth Cockrel, Jr. 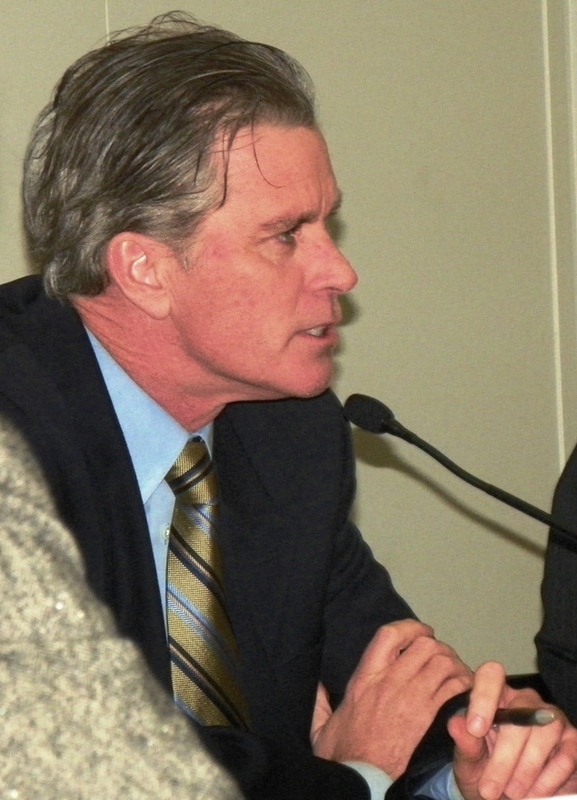 They voted on April 4 for the CFSA on the advice of Deputy Mayor Kirk Lewis and attorney Michael McGee, a co-author of Public Act 4, from which the FSA derived. 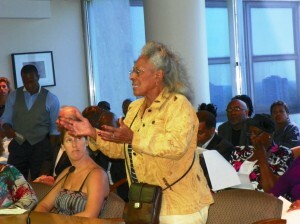 Phyllis "Chris" Griffiths confronts Council during Sept. 13, 2011 session. Several of the five complaints filed so far cite the eight officials for violating state and city laws which say that the city cannot contract with anyone who has defaulted on debts to the city. “Based on Michigan Compiled Law 117.5 (a) (f), the City of Detroit, its executive branch departments and legislative branch agencies, is prohibited from making a contract with, or giving an official position to, one who is in default to the city,” says Phyllis Griffiths’ complaint, filed May 22. 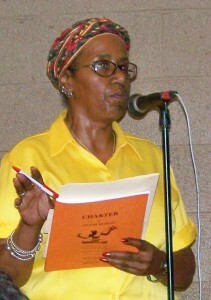 APTE VP Cecily McClellan at Charter Revision Commission meeting Aug. 10, 2010. Crittendon told State Treasurer Andy Dillon in a letter May 11 that the agreement is null and void because the state has not paid outstanding debts to the city, including $224 million in revenue sharing payments, and a $4.75 million water bill. She is scheduled to hold a “conference call” with State Treasurer Andy Dillon and State Attorney General Bill Schuette next week, a step required prior to taking court action. Other complaints cite violations of state and city laws that Crittendon listef in an opinion dated April 1, given to the Mayor’s Office and Council three days before the Council’s vote. Cecily McClellan, Vice-President of the Association of Professional and Technical Employees (APTE), cited some of those provisions in her complaint, also filed May 22. “. . . . the Consent Financial Stability Agreement relinquished control of City of Detroit finances to the State of Michigan via a Chief Financial Officer, Program Management Director, and nine non-elected and potentially non-Detroit residents. The Detroit City Council does not have the authority to delegate the power of their elected positions to a non-elected body and cause increased financial harm to the city . . . ,” McClellan wrote. 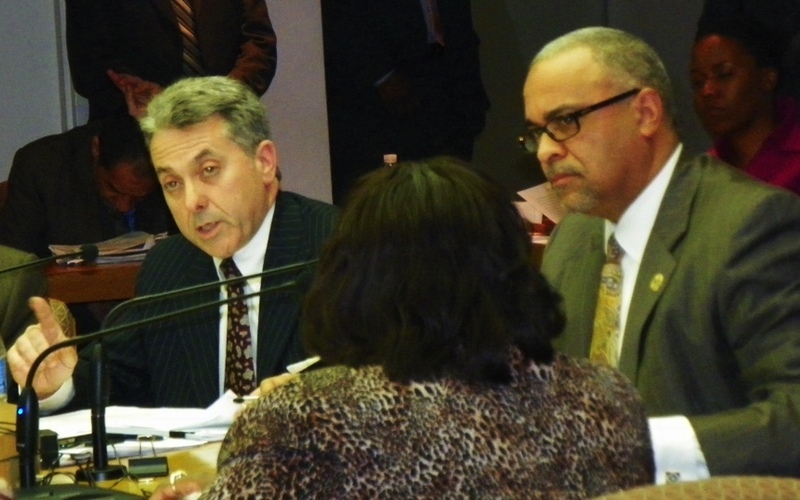 Attorney Michael McGee, co-author of Public Act 4, and Deputy Mayor Kirk Lewis at Council table. Her complaint says the eight officials violated state law by approving “unfunded mandates” included in the CFSA, that the CFSA exceeds the “police powers” of the Council, and that there is no legal ground to put a Financial Advisory Board in charge of approving union contracts. Crittendon’s April 1 opinion also said there is no statutory authority to establish a Financial Advisory Board period. State Treasurer Andy Dillon during FInancial Review Team meeting March 26, confronted by a chanting crowd. McClellan also noted that Pugh, Tate and Cockrel, Jr. negotiated terms of the deal secretly with State Treasurer Andy Dillon, although they were not delegated by Council to do so. Lewis named the three during a Council meeting April 2. The Board of Ethics meets in the First National Building, where the City's Law offices are located. If, after investigation, the Ethics Board finds officials guilty of the complaints brought against the, it can issue a “public admonishments,” recommend disciplinary action against non-elected employees, recommend that the City Council initiate removal or forfeiture [of office] proceedings against elected or appointed officials, impose financial administrative sanctions, or have the City’s Law Department (which is headed by the Corporation Counsel), initiate prosecution of the individual(s) involved. According to the city’s website, the Ethics Board is comprised of Executive Director Deborah J. Gaskin, Chairperson James W. Heath, Esq., Vice-Chairperson Hon. Harold Hood, and members Dr. Marsha Foster Boyd, Beth Greenberg Morrow, Esq. and Alicia J. Skillman, Esq. They are not allowed to discuss pending complaints, without the presence of the party being charged. 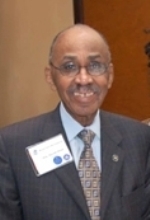 Gaskin, a criminal defense attorney who has practiced law since 1973, was one of the attorneys who represented Charles Beckham and Darralyn Bowers against 1983 federal complaints involving contract-peddling in the water department, during Mayor Coleman A. Young’s administration. At the time, many felt the investigation’s real target was Young. James W. Heath is a Wayne County Assistant Prosecuting Attorney in the Public Integrity Section. The Hon. Harold Hood retired as Chief Judge Pro Tem from the Michigan Court of Appeals after serving in both Recorders and Wayne County Circuit Courts. He currently works with the National Consortium on Racial and Ethnic Fairness in the Courts. 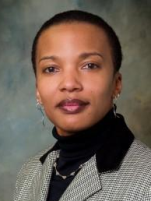 Dr. Marsha Foster Boyd is President of the Ecumenical Theological Seminary and a board member of ARISE Detroit. Beth Greenberg Morrow is a criminal defense attorney, a deputy defender at the Legal Aid and Defender Association (LADA), and a research attorney with the State Appellate Defenders’ Office. Alicia J. Skillman is Director of LADA’s Fair Housing division, and Executive Director of the Triangle Foundation. To download a copy of the Ethics Board complaint form, click on Board of Ethics Complaint_Form_042007 . To go to City of Detroit’s Ethics Board page, click on http://www.detroitmi.gov/Departments/BoardofEthics/tabid/73/Default.aspx. To read City Charter ethics provisions, click on Revised City Charter with ethics provisions highlighted. To read Crittendon’s May 11 letter, click on Crittendon letter 5 11 12. For more information on “Free Detroit” and the complaints campaign, call 313-444-0061.